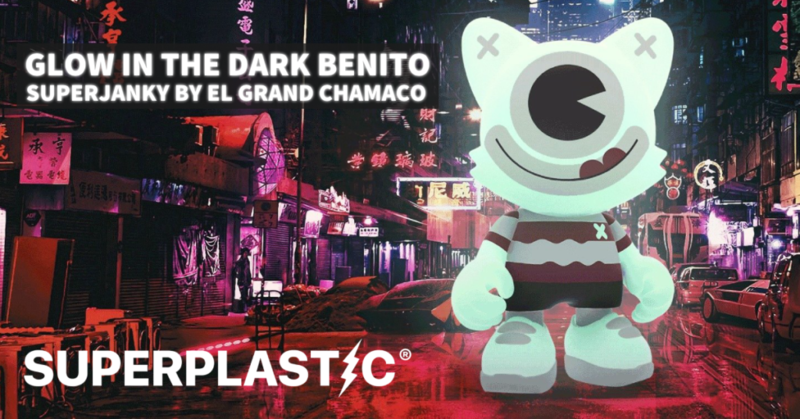 Make your Black Friday a little brighter with a new GLOW IN THE DARK release from Superplastic x El Grand Chamaco! This new 8inch SuperJanky has been released into the wild today as part of a Black Friday special from Superplastic! You can purchase this GID Benito SuperJanky for $75 (£59) over on the Superplastic online store HERE. Limited to 333 pieces. Superplastic also launched their special BLACKFRIDAY code to get 20% off when you spend $100 in the Superplastic store! Full case of 24 Janky down from $220 to $176! Head on over to their online store HERE and make sure you use the code when you have spent $100! You can follow all the other Designer Toy Black Friday Deals HERE!